Kalyanotsavam Tirumala, marks the hour-long celestial wedding ritual performed according Vaikasa Agama Sastra for the Utsava Murthis of the Lord along with His consorts Sri Devi and Bhu Devi in the Kalyana Mandapam. Priest conducts the marriage and an archaka is consecrated to perform other rituals on behalf of the bridegroom. 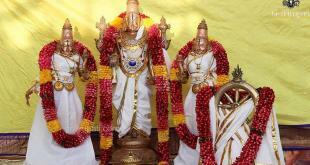 The idols of The Lord and His brides face each other with a screen in between them. After the priests perform appropriate homam, the bridegroom and the brides are allowed to see each other at the appropriate auspicious moment as the screen is removed. 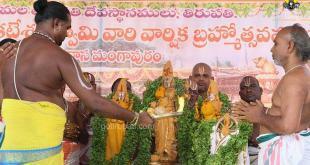 This is followed by Mangala sutra dharana, Tahlambralu and then Lord and his consorts are garlanded. Agni Pratishta : Then follows Agni Pratista where in the pious agni is lit and Prayaschitta homam is performed. Maha Sankalpam : Then the important phase of the ritual, Maha Sankalpam is performed where in the descendent of Tallapaka family (the family which dedicated their lives in the service of Lord Venkateswara since last 600 years) performed Kanyadanam on behalf of Goddesses. Mangalya Dharana Mahotsavam : The Divine Wedding Ceremony comes to a grand end with, Mangalya Dharana where the Lord Venkateswara tied the Holy Mangala Sutrams to His beloved Consorts. Varana Mayiram : This is a prominent and most entertaining phase usually performed during South Indian Hindu Weddings. The Lord and His Consorts played with floral balls and coconuts facing each other. (Here the priests and Tallapaka descendent perform this ritual on behalf of the deities). After this the garlands of deities are also exchanged. Aarti : After the conclusion of the pleasant “Love Game”, the Consorts are seated on either sides of Lord, with Sridevi taking the Right side and Bhudevi occupying the left place of Maha Simhasanam. Now Karpoora Aarati, Nakshatra Aarati and Maha Aarti were rendered marking the grand ending of the Celestial Wedding Ceremony of Lord Malayappa Swamy with His two Consorts-Sri Devi and Bhu Devi. There are no inscriptions relating to Kalyanotsavam till 1546. It was first introduced by Talapakka Tirumalayyangar. 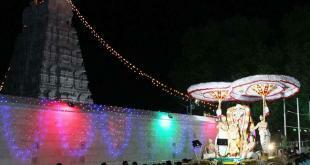 At that time, Kalyanotsavam was conducted in the Tirumamani Mandapam for five days in the month of Panguni. Kalyanotsavam Seva ticket holders Queue line will be merged with other Paid Services Queue Line. Kalyanotsavam Tickets can be obtained either online at ttdsevaonline or through current booking process at CRO Office Tirumala or by submitting recommendation letter at J.E.O Camp Office Tirumala. Kindly leave your comment below, We will get back to you at the earliest. How to advance booking to kalyanostavam tickets? You need to book online for booking please check with the official site. You can perform kalyanothsvam at 10 am and you need to book that online for booking please check with the official site. I have booked for Kalyanotsavam seva on 11-2-2019..My friend says that special dharsans are not performed on Feb 11th and 12th due to Rathasabthami. Kindly clarify whether Kalyanotsavam will be performed on 11th Feb 2019. You need to check with the official contact please contact the official site . How many allowed for one ticket? It cost you Rs 1000 for couple only 2 people are allowed . Yes after the seva you will be allowed to have darshan .